It comes to the 21st edition of FIFA World Cup in 2018 summer. We witnessed lots of impressive moments and records in previous tournaments as well as rounded up several charts of what fans are most interested in, one of them is top goal scorers. Since 1930 FIFA World Cup, over one thousand footballers scored over two thousands goals. We list the leading World Cup scorers and expect the highest scorer in FIFA World Cup history will appear in Russia 2018. 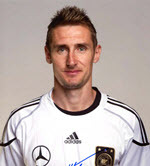 Miroslav Klose played for Germany national team as a striker. He attended four World Cup tournaments from 2002 to 2014. He showed a great performance in his debut World Cup 2002 and won Golden Boot for 5 goals. In the following 3 tournaments, he scored 5, 4 and 2 goals separately. He topped on the leading World Cup scorers chart for 16 goals in his whole World Cup career. After Germany won 2014 World Cup champion – in August 2014 – Klose announced his retirement from national team. Ronaldo is one of the greatest football players in the world. When he was 17-year old, he went to 1994 World Cup but didn’t play. 1998 World Cup became his debut World Cup. He was scored 4 goals and was awarded Golden Ball as the best player. In 2002 World Cup, Ronaldo scored 8 goals and led Brazil to win the title. He scored 3 goals in his last 2006 World Cup. In February 2011, Ronaldo played his last match for Brazil friendly against Romania and retired as a football player. Gerd Müller is a legendary German football striker known for his clinical finishing in and around the six-yard box. 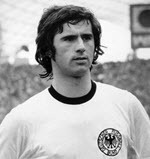 He scored 10 goals for West Germany at his first 1970 World Cup and won Golden Boot as top goalscorer. In the next 1974 World Cup, he scored 4 goals including one in the final which leads West Germany to be crowned in this tournament. Gerd Müller kept the record of the highest World Cup scorer with 14 goals for 32 years till Ronaldo made a new record (15 goals) in 2006. Just Fontaine, this French football forward, only played one World Cup – 1958 World Cup and made a profound impression for his high goal-to-game ratio (13 goals in 6 matches) which drives him to be highest goalscorer in a single World Cup edition of all time. He definitely deserved Golden Boot award. However, Just Fontaine has a short football career. When he was 28 year old, he played his last game in July 1962 and retired for a recurring injury. Pelé (Edson Arantes do Nascimento) started out playing for Brazil nation football game when he was 16-year old. In 1958, he attended his debut World Cup as the youngest player at that time. He finished this tournament with 6 goals which contains a hat-trick in semifinal, 2 goals in the final and won World Cup. Soon, he became the world-renowned and best-rated player in the world. He led Brazil to won 1962 World Cup again but encounter failure in 1966 World Cup – eliminated in the first round. 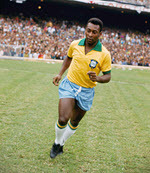 Although Pelé refused to attend 1970 World Cup but eventually accepted. In this World Cup, Brazil formed the greatest football team in history and received the title. 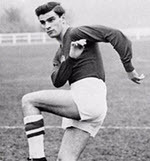 Sándor Kocsis had the highest goals-to-games ratio in top 10 World Cup scorers with 11 goals in 6 matches – 2.17 goal/game average. He only played 1954 World Cup for Hungary national team and was the top goal scorer in the edition. He was also the first player who scored two hat tricks in a single World Cup. In 1966, Kocsis retired as a player but worked as a coach. In July 1979, he died, aged at 49. It was a controversy whether his death was a suicide or an accident. When Jürgen Klinsmann was a footballer, he played 1990 World Cup for West German Team and won the champion. He also played 1994 (5 goals) and 1998 World Cup (3 goals) for reunified Germany but didn’t take a good place, being eliminated in the quarterfinals. After retiring as a player, Klinsmann was appointed as the new head coach of Germany national team in July 2004 and led Germany to take the third place in the 2006 World Cup. 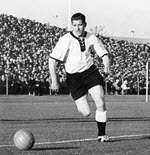 Helmut Rahn became a big name after he scored the winning goal in 1954 World Cup final – which is known as The Miracle of Bern – leading West Germany to defeat formidable Hungary (3-2) and lift the trophy. In 1958 World Cup, Rhan was named in Germany squad again. With the goal against Yugoslavia, he scored 10 goals in total and became the first player who scored at least 4 goals in 2 different World Cup tournaments. 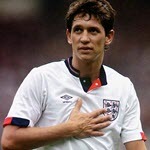 Gary Lineker is the England record holder for FIFA World Cup finals goals, 10 in total. In his first 1986 World Cup, he played 5 games for England team and won Golden Boot for 6 goals, including a hat-trick against Poland in this tournament. In 1990 World Cup, he scored 4 goals leading England to reach semi-finals but lost against West Germany. Lineker started his media career as a football pundit on BBC ratio after retirement. Now, he is a very professional sports broadcaster. When Gabriel Batistuta was selected as a member of Argentina for playing Copa America in 1991, his international football career kicked off. 1994 World Cup is Batistuta’s first World Cup but ended with a disappointment. But he still scored 4 goals including a hat-trick. In 1998 World Cup, he scored his second hat-trick in World Cup and became the first player to score hat-trick in 2 different World Cups. 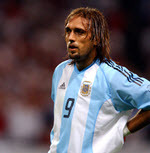 Batistuta played his third World Cup in 2002 but retired with regret for Argentina was knocked out in the opening round. 2018 World Cup eventually started its opening match on June 14, 2018. As a loyal fan, during the one month tournament, you may long for watching every match to support their favorite teams from group stage to World Cup Final if possible. However, it is very hard to wait for live matches before TV whole day due to work, study or other reasons while live football streaming apps bring more chances to enjoy desired games on mobiles whenever and wherever. In this article, we would like to recommend the top 5 apps to watch live football streams, like FIFA 2018 World Cup, on iPhone, iPad, Android, Apple TV etc. Sky Sports, the dominated television sports brand in United Kingdom and Ireland, collects a series of channels to broadcast various sports including Football, Cricket, Golf and more. It specially sets up an exclusive Premier League channel where people can watch all 126 matches of 2016-17 to 2017-19 seasons. The comprehensive football channel offers live streaming or other association football games and is believed to be a great place to enjoy 2018 World Cup. Not only can you watch football live streams with Sky Sports app, but receive the latest football news, live scores and videos of goals, highlight from matches. Simply download this live football app and log in with your Sky ID to watch favorite football games on iPhone, iPad, iPod Touch or Android mobiles. Sports programs of CBS Sports have been expanded from its premier NLF, NCAA to mixed genres covering soccer, basketball, golf, boxing etc, throughout the year. Through this live football streaming app, you can easily watch football games (like 2017-18 UEFA Champions League, 2018 World Cup) in real-time and listen to live original sports shows. Schedules, live scores and break news of ongoing and upcoming matches will be sent to you. Unfortunately miss some brilliant matches? Highlight and goal videos can reproduce best moments. Apart from mobiles, it is available for Apple Watch app for live scores and news alerts. And, the support of Apple TV and Chromecast helps watch live football and on-demand content on TV with a larger screen. WatchESPN keeps cable and satellite television subscribers accessed to sports live streaming from ESPN channels. Live sports events of soccer, basketball, baseball, golf, tennis etc, and ESPN shows can be streamed to mobiles, TV and game consoles. Like above two live football streaming apps, it brings scores and news about football games, players and more. With search function, you can easily get information including news, events and shows of your favorite team immediately. WatchESPN app for iOS also supports AirPlay of all ESPN channels to stream contents from iPhone, iPad to Apple TV. It should be noticed that WatchESPN app includes ads based on your interests. You can reset the advertising identifier or quit of the ads via mobile device settings within this app. Unlike special live football streaming apps, Ustream plays as a versatile live video player enabling you to watch live or recent videos all over the world. Discover and follow the channel of football and you can get notifications of live or upcoming events. 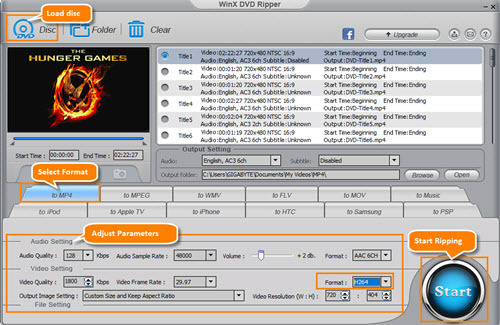 You can also create an own channel to schedule and manage football events you’re attending. What’s more, you can broadcast football live if you’re watching a match or upload pre-recorded videos to Ustream with original quality for sharing with others. Interactive chat during live broadcast is opened to everyone. The basic service of Ustream is free but contains ads while paid service starting at $3.99/month can remove all in-video and display ads. You’re free to choose any plan you like. Livestream is powered to stream the world’s live events covering sports, news, concerts and more offered by sports leagues, BBC, Spofity and other companies or organizations. It allows you to explore desired live football matches for watching or follow favorite broadcasters to get notifications of upcoming games. As Ustream, it makes you as a live broadcaster via cameras on your devices. GoPro broadcasting for iOS is supported as well. Viewers can watch your HD live video on Facebook, Twitter, Livestream or other websites. In addition, built-in chat is available. You can free download this football live streaming app on your iOS/Android for watching live football competitions whenever wherever or stream to TV for enjoying live events on big screen.